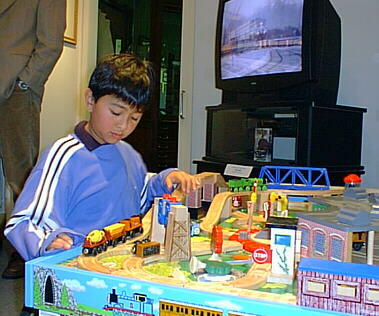 Children of all ages enjoyed the Lionel layout in the front window! The Santa Maria Valley Railway Historical Museum, located in the Santa Maria Town Center Mall (upstairs across from the Robinson-May Co.), held their Second Annual Lionel Christmas Open House on Saturday, December 13 from 1:00pm to 4:30pm. 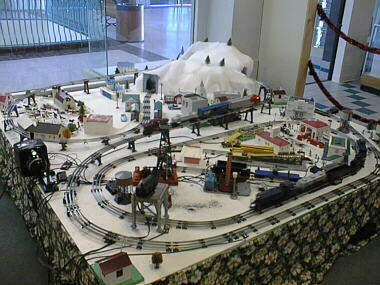 This year the museum featured a Christmas Lionel Train display depicting a store window display during the 1950's when toy and retail stores around the country built elaborate window toy train displays for the Christmas holidays. 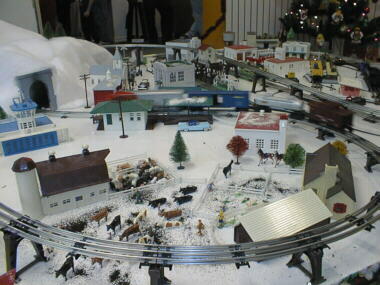 The Christmas Lionel Train display featured locomotives and rolling stock from the 1950's along with many of the popular Lionel accessories that were available. 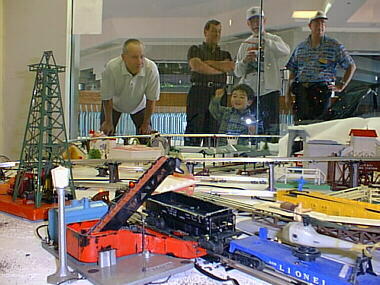 The Thomas the Tank hands-on display is always a big hit with the younger railroaders. 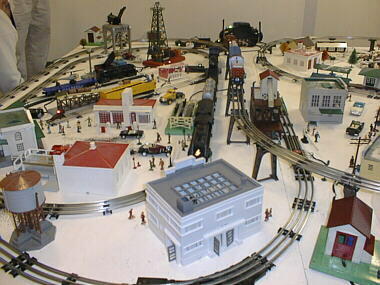 Also featured was an HO model of the Santa Maria Valley Railroad yard during the 1950's when both steam and diesel locomotives operated in Santa Maria. 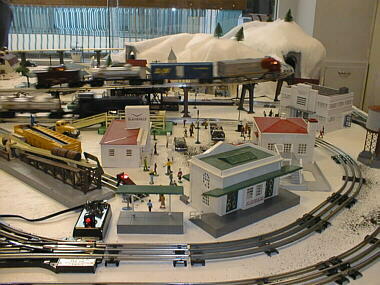 The recently completed model was hand built by museum members. 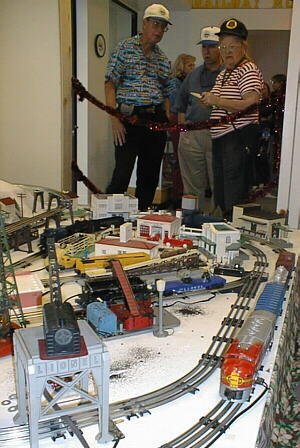 Both the Christmas Lionel Train display and the Santa Maria Valley Railroad yard had trains in operation during the open house. Also on display were exhibits of the Pacific Coast Narrow Gauge Railroad which ran in the early 1900's from Avila Beach to San Luis Obispo and to Santa Maria and on to Santa Ynez, and the Santa Maria Valley Railroad and its flamboyant owner Captain G. Allan Hancock. 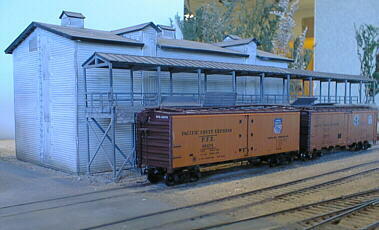 A Southern Pacific train passes the enginehouse (left) and ice house (right) on the HO model of the Santa Maria Valley Railroad. The Gift Shop was open with railroad theme Christmas gifts, museum t-shirts, hats, videos along with Hal Madson's book Railroads of the Santa Maria Valley. Hal was there to sign your copy! Docents were on hand to talk about present operations and future plans for the museum. Refreshments were served throughout the afternoon. KCOY-TV interviewed Museum President Dan Alves (far right) as members of the Museum look on. SMVRR ice house on the HO layout. Locomotives were swapped out about every 60 minutes so they wouldn't get too warm. The Santa Maria Valley Railway Historical Museum is preserving the tale of two of the more intriguing short line railroad companies on the Western United States. The Santa Maria Valley Railroad became prosperous under the ownership of the flamboyant Captain G. Allan Hancock. Captain Hancock's penchant for steam locomotives kept steam locomotives running on the Santa Maria Valley Railroad until 1962. The Santa Maria Valley Railroad was one of the last railroad companies to operate steam locomotives for revenue freight service. Captain Hancock invited Walt Disney for old steam locomotive no. 21's final run in February 1962. Both Captain Hancock and Mr. Disney rode in the cab of the locomotive of that final run. After Captain Hancock passed away his widow, Marion, took over the presidency and with Sue Sword as General Manager, became one of only a few railroads in the world controlled by women. At the height of the sugar beet production in California during the 1970's, the Santa Maria Valley Railroad was one of the most profitable short line railroads in the Western United States. Today the sugar beet plant in Betteravia is closed but the Santa Maria Valley Railroad continues to prosper serving local industries' railroad transportation needs in the Santa Maria Valley. The Santa Maria Valley Railroad along with the rest of the nation's railroads, has a very vibrant history of building this nation, enters the 21st century a very integral part of this nation's transportation needs. The Pacific Coast Narrow Gauge Railroad once ran from Avila Beach to San Luis Obispo before heading south to Arroyo Grande, Santa Maria and Santa Ynez. Plans to lay track to Santa Barbara never materialized, but the feisty narrow gauge (rails of the track were closer together than the standard gauge track of today) stayed alive until the 1940's, long past almost all of the other narrow gauge railroad companies in the United States. Some of the rails still exist under city streets in Santa Maria. The Santa Maria Valley Railway Historical Museum (SMVRHM) was founded in 1999 dedicated to the preservation of the railroad heritage of California, the Central Coast, and the Santa Maria Valley. The museum is open on 1:00 pm to 4:30 pm Saturdays and Sundays in the Santa Maria Town Center Mall upstairs across from the Robinson-May Co. General Meetings are held every first Thursday of the month at the Santa Maria Inn. The SMVRHM has acquired and is currently restoring Santa Maria Valley Railroad caboose number 180.